The Best Science Fiction and Fantasy of the Year: Vol 8 – Table of contents! 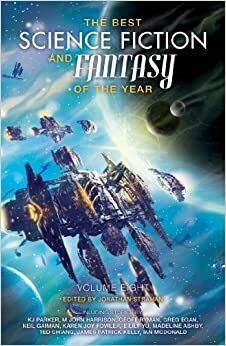 I am delighted to announce the table of contents for The Best Science Fiction and Fantasy of the Year: Volume 8. This year’s book covers stories first published in 2013, and should be out in stores from new publisher Solaris(!) in May. As always, there’s still a lot to do – the cover needs to be finalised (some design elements are under discussion), copyedits to be done, the running order may change and so and so forth – but this is the essence of the book you’ll see later this year. I am particularly excited because this is the first year the book will be published in the UK and Australia. Looking forward to it! Glad to see the series continuing (long may it run). Thanks! I appreciate the support for the series. Wow, from my count almost half of the stories are from online venues. Just goes to show there is a lot of great fiction out there if you know where to look. Looking for to the book from its new home.